Do you have a green thumb? Test your skills as the victor of vines by typing the words shown on the screen, and grow your beanstalk from a tiny tendril to massive cloudscraper in this calming, zen-like typing game. 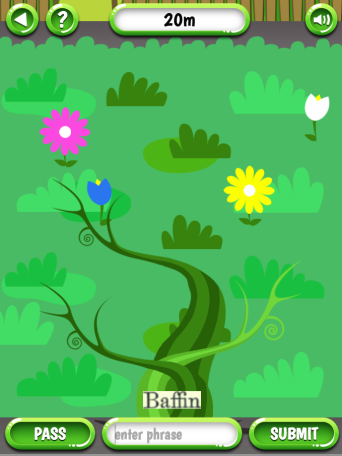 Beanstalk is a quick and easy browser game that asks players to type the word they are shown on the screen. By presenting players with words from books of libraries’ scanned digital collections, Beanstalk collects transcriptions that are sent back to the libraries that the words come from. The more words players type correctly, the faster the beanstalk grows, and the more contributions are made to libraries’ and museums’ collections. Get to the top of the “High Score” leaderboard by correctly transcribing the most words, and declare yourself the victor of vines! Type the word shown at the bottom of the screen and press enter to grow your beanstalk. Punctuation matters, but capitalization does not. If you can’t type the word, press “pass” to get a new one. Your beanstalk will sprout flowers every four correct words, saving your progress from future mistakes. Beanstalk tackles a major challenge for digital libraries: full-text searching of digitized material is significantly hampered by poor output from Optical Character Recognition (OCR) software. When first scanned, the pages of digitized books and journals are merely image files, making the pages unsearchable and virtually unusable. While OCR converts page images to searchable, machine encoded text, historic literature is difficult for OCR to accurately render because of its tendency to have varying fonts, typesetting, and layouts. Beanstalk presents players with phrases from scanned pages from cultural heritage institutions. After much verification, the words players type are sent to the libraries that store the corresponding pages, allowing those pages to be searched and data mined and ultimately making historic literature more usable for institutions, scholars, educators, and the public. Play Beanstalk, save scanned books from digital oblivion. Beanstalk functions best in Firefox 38+, Safari 8+, Chrome 43+, and Internet Explorer 11+. You can also play Beanstalk from your browser on iPads generation 3 and newer, as well as most Android devices. Collaborators: Created in partnership with the Missouri Botanical Garden, the Biodiversity Heritage Library, Harvard University, Cornell University, and the New York Botanical Garden as part of the Purposeful Gaming and BHL project. This project was made possible in part by the Institute of Museum and Library Services (IMLS).